RANGOON— On the first day of their meeting, Police Lance Corporal Aung Phite was hesitant to approach five-month-old German Shepherd puppy Michael. He had been bitten by dogs at least four times in the past and prominent scars on his legs reminded him of his bitter experience with the animals. But the puppy greeted him with a wagging tail and swept his fear away. From this day forward they became “the handler and his sniffer dog,” and the bond between them grew and grew. Aung Phite referred to Michael as his “Son” and Michael was ready to jump on Aung Phite’s colleagues whenever they pretended to fight his handler. “Since I met Michael, I am no longer afraid of dogs and I like every dog I see,” said Aung Phite. Their five-year long companionship came to an abrupt end in April. Michael died of gastrointestinal problems on April 15 during the Burmese New Year water festival after serving as a member of Rangoon’s police bomb squad team together with Aung Phite for over four years. Michael’s death drew much public attention since he was the most popular sniffer dog in the country. 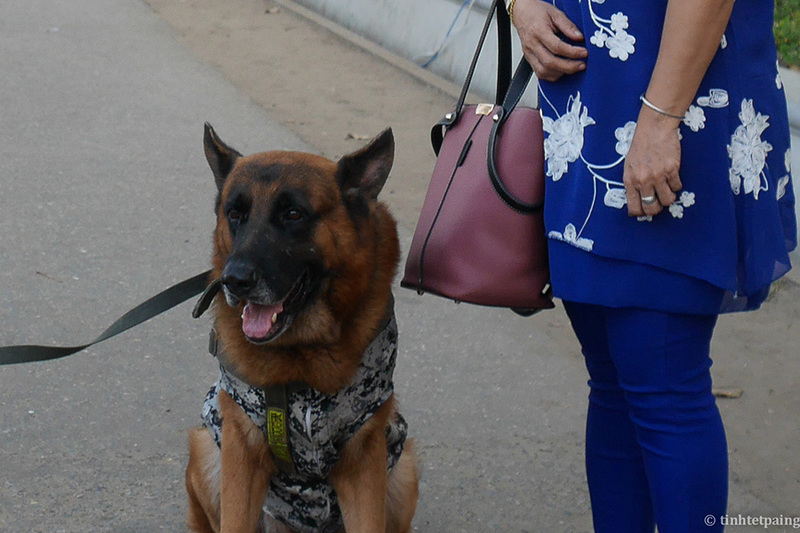 It was partly because he was also the only sniffer dog of Rangoon’s Bomb Squad Unit carrying out duties at important public events and state-level occasions in the city. But Michael’s death also shined a spotlight on the harsh working lives of Burma’s sniffer dogs and revealed the struggles of their handlers. Aung Phite and his wife Myint Nwe Win said the cause of Michael’s death was possibly intense fatigue, brought on after frequent irregular meals carrying out back-to-back missions as the only sniffer dog on duty in the country’s biggest city. Like other sniffer dogs, Michael got his salary—40,000 kyats monthly (just under US$30)—for his service. From his salary, 10,000 kyats was for monthly medical care and the rest was for his allowance: only 1,000 kyats per day. After Michael’s handler family petitioned the authorities requesting to raise his allowance so that the family could sufficiently cover his costs, Rangoon’s police chief provided 1,600 kyats per day out of his own pocket for Michael. “We would need around 4,000 to 5,000 kyats minimum to sufficiently cover the daily cost of such a dog,” Aung Phite said, explaining that the average price of decent rice in Burma is around 1,500 kyats per kilogram. Ma Myint Nwe Win said she prepared two boiled eggs and milk for breakfast and two meals of rice or porridge mixed with chicken every day, for the 70-pound animal, which cost the couple about 3,000 kyats per day, not including money for his snacks. Whenever there was any major treatment that Michael needed to go through, the couple had to cover the bill in advance, Ma Myint Nwe Win added. Michael is seen at at a ceremony commemorating Union Day in Rangoon’s Mahabandoola Park in February. 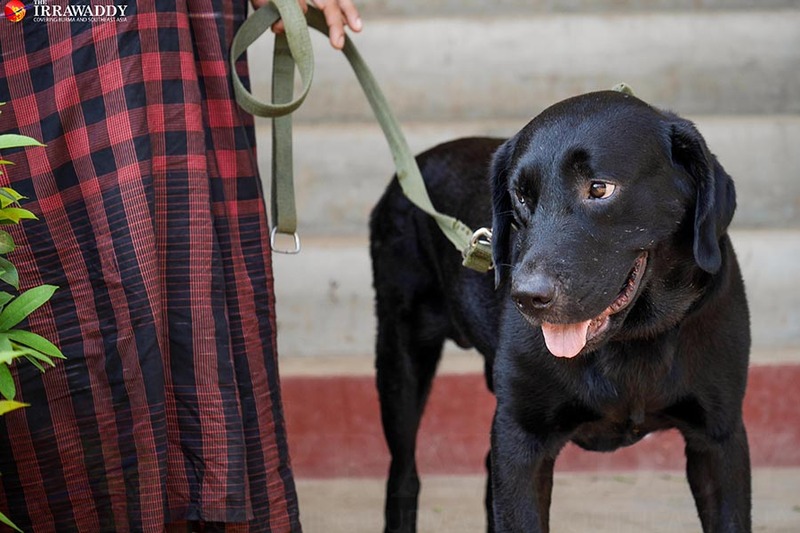 According to Ministry of Home Affairs, Burma has a total of 136 security dogs serving across different departments of the police force and the army, including the Crime Investigation Department (CID), bomb squads, and border guard forces. Out of the 136 security dogs, 55 finished training at the Central Military Dog Training Academy in Mingalardon Township, Rangoon for the skill of sniffing explosives and drugs. Michael was also the most loved sniffer dog among police official. But he didn’t earn this position easily. He passed the police test by finding all 28 real bullets hidden around a stadium in Naypyidaw ahead of the 2013 Southeast Asian Games to examine his sniffing skill. He also helped his team find and disable four improvised explosive devices in Rangoon during his service with the bomb squad. According to a Sergeant who asked not to be named and was once Michael’s trainer at the academy, the training starts in August every year and lasts for six months, during which the dogs have to learn obedience and the required skills. There are between 15 and 40 dogs sent by both police force and the army every year at the academy for training, he said. He also said the dogs are trained for at least six hours a day together with their handlers at the academy and it is quite intensive. Trainers have to use gun powder to teach dogs explosive sniffing skills, which has an impact on such dogs’ health state, he added. Each year, there “multiple” dogs had died during the training process, he said. “When dogs [on the training course] died, it was found that the most common causes were in the lungs, liver, and intestines—the cause of Michael’s death,” he said, stressing the need to provide thorough medical care to the dogs regularly. An experienced veterinarian Daw Tin Yee told The Irrawaddy that sniffer dogs normally have shorter lifespans than normal pet dogs, though this impossible to avoid due to the nature of their work. However, she said, she is “not surprised” to learn that sniffer dogs are not valued in a country where the government had no habit of appreciating even people who serve the country. Another veterinarian Ko Soe Moe Lin, who has experience of treating security dogs, told The Irrawaddy that such dogs should receive a monthly or bi-monthly medical check-up as their work has an impact on their health. They should be provided days off after every mission, he added. Michael started getting sick on March 30 and after three days, he had blood in his stool. Under his veterinarian’s care, he seemed much better until he got unwell again on April 10. While sick, he was brought to carry out duties on April 13—the first day of Thingyan—as people started celebrating the water festival in the city. He and Aung Phite were picked up by his team and headed to work around noon, despite Aung Phite wife’s protests. “My son was feeling very unwell and I didn’t want them to take him out [for duty] but we don’t have the right to speak out and have to do as ‘they’ say so,” Ma Myint Nwe Win told The Irrawaddy. After three hours of duty, Michael experienced trouble breathing and was immediately admitted to a dog clinic. Two days later, he stopped breathing. Local filmmaker Ma Kyi Phyu Shin broke the news of Michael’s death on Facebook as she witnessed the moment Aung Phite and his wife buried him in their backyard. Her pictures of Michael’s funeral saddened her social media followers and the city’s dog lovers. Many visited the house of Aung Phite and wife to see Michael’s grave and learnt the plight of other sniffer dogs like Michael at the same time, which finally resulted on them founding a charity group named “For Brave Dogs” under the management of filmmaker Kyi Phyu Shin for the welfare of the country’s sniffer dogs. The charity group will be launched officially on May 15, the one-month anniversary of Michael’s death. 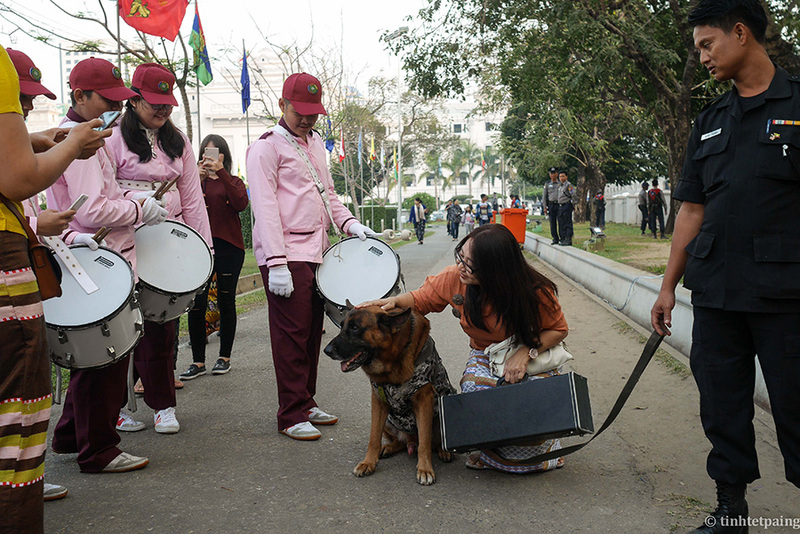 Ma Kyi Phyu Shin explained that the welfare group plans to donate 30,000 kyats monthly to every sniffer dog that on duty after finishing training at the Central Military Dog Training Academy (Mingalardon). 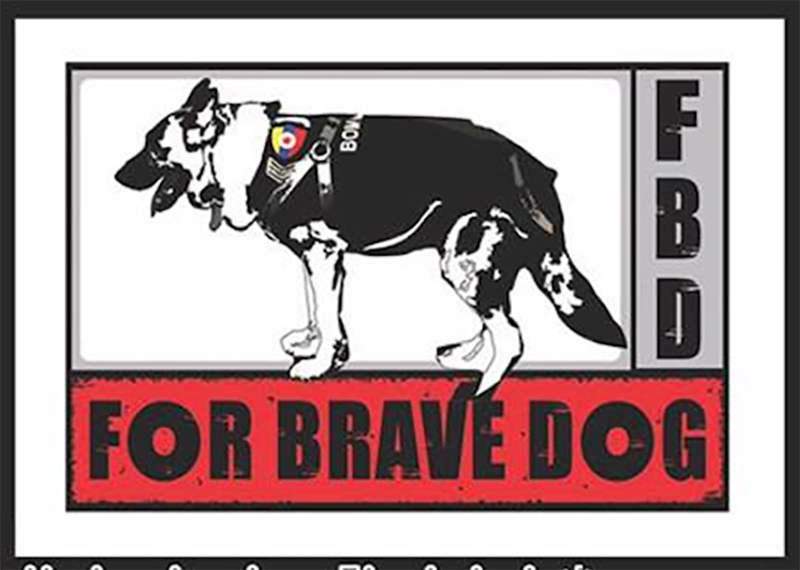 In addition to monetary donations, the group will provide necessary medical care for on-duty sniffer dogs with the assistance of veterinarians across the country, she added. Following Michael’s death, Rangoon regional government’s police authorities bought two yellow Labrador Retrievers that will be assigned as the city’s sniffer dogs after training at the Mingalardon academy. The one-and-a-half year old black Labrador Rambo will fill in for Michael until the police have more trained dogs to take on the role. On April 19, like Buddhist Burmese do when one’s family member passes away, Aung Phite and his wife held last funeral rites for Michael on at the police quarters in Rangoon’s Yankin Township, where mourners donated food and other offerings to Buddhist monks. Sergeant Michael carried out his duties at nearly 600 important events in Rangoon and Naypyidaw during his four-year service with the squad, including working during the 2014 visit of former US President Barack Obama to Burma, as well as the 2013 Southeast Asian Games. He served at state-level events, presidential visits, football matches, and motion picture academy awards ceremonies, according to Aung Phite. Ma Myint Nwe Win said with tearful eyes how she missed her jaggery-loving son sitting beside her and looking at her face when she applied thanakha before going out. She said she hopes if they were to have a child in the future, it would be the reincarnated spirit of Michael.